People tell me my house always looks clean and tidy and yet I devote very little time to cleaning. I must have a gift. I also went through a house-proud period in my early marriage and became so obsessed that the one day I dedicated to cleaning, I refused to cook because it would spoil the shiny, sparkling kitchen. I’m not like that anymore, but I do dislike people leaving a mess (except me). 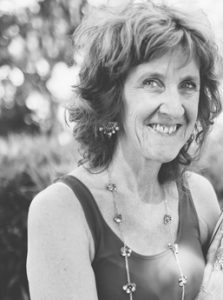 My darling MiL was the hardest working person I knew. She ran from morning til night cleaning, washing & caring til she could do it no more. Her children all talked about the artwork she had done over the years but all the searching never uncovered it. I suspect she discarded it as ‘dust-collectors’ that no one would be interested in. There is nothing left of her now. Nothing of her personality to share with her grandchildren and great grandchildren. And the beautifully clean home? Sold. This reminds me of something a writing friend said to me once, Karen. What would you prefer to have written on your grave: she kept a clean house or she wrote a good book? I know what I’d prefer. Your second story makes that point. And extraordinary about your gambling friend? I suppose when you write about the things you don’t talk about it keeps it all a lot cleaner. Not that this is your intention but perhaps his. I too enjoy the fantasy of winning TattsLotto. So many of us do but I don’t know many people who rely on it as a way of resolving their difficulties. thanks, Karen. 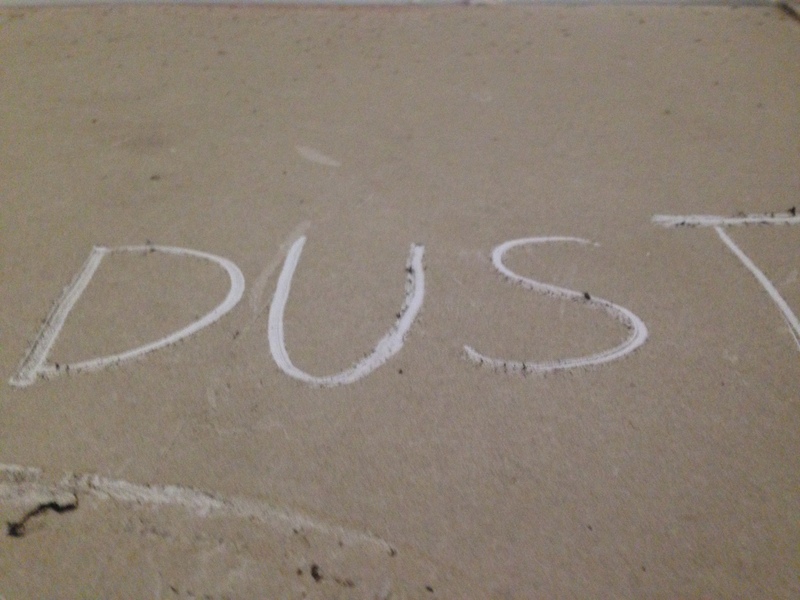 Whenever I think of dust the following quote always comes to mind: “There is no need to do any housework at all. After the first four years the dirt doesn’t get any worse.” It’s by Quentin Crisp but the one thing about it that’s always puzzled me is that he was gay, quintessentially gay even, and if there’s one thing one tends to associate with homosexuals nowadays it’s their sense of cleanliness, perhaps as a natural reaction to being considered unclean (at least in a spiritual sense) by so many. I am not a cleaner and certainly not a fastidious one. I can even tolerate a fair amount of chaos as long as my personal spaces are orderly. When I’m working the rest of the house disappears pretty much anyway. I’m more of a tidier. A little dust her and there doesn’t offend or upset me in the slightest. If I know people are coming over I make more of an effort but even then I never go to extremes. 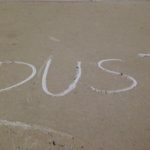 I don’t see any point in dusting—it doesn’t remove anything, it simply spreads it around—and so I’m more likely to wipe down surfaces with a damp cloth. The bird’s cage is obviously the dirtiest thing in the flat. Who would ever have imagined such a tiny creature could create such mess and actual devastation? If he’s not throwing seeds around willy-nilly he’s shredding cardboard boxes, shedding feathers and pooing wherever and whenever the mood takes him. I do understand why cleaning might become an obsession. I’ve started working on editing ‘Left’ which is my only novel where all the main characters are women. The narrator’s a middle-aged woman who’s never worked after leaving uni and is perfectly content to be a housewife for a variety of reasons which I won’t go into but high up on the list is the fact that a home can be controlled when so many things in this life, particularly people, cannot. And so she cleans and tidies. It’s that fantasy of control that fascinates me, Jim. To clean is to control and of course it’s illusory as with so many things. And it’s an issue that tends to assail women more than men because life has so far dictated that it’s mostly the women who get to clean, though that’s not always the case. Interesting what you say about Quentin crisp. Maybe the need for cleanliness reflects things that go beyond gender. All I know is that our need for cleanliness is a construction based in part on the human need for hygiene. We live longer lives when we keep certain germs at bay especially in places like hospitals and kitchens, but also the extremes of cleanliness can be dangerous, too. Hence all the allergies these days. As usual a balance is what we need.